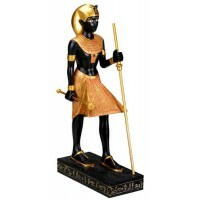 This set of bookends looks great on any shelf and features Guardian statues found in King Tut's tomb. 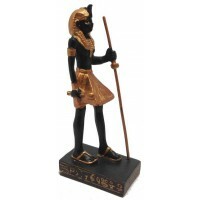 Set of 2 bookends are cold cast resin and feature statues modeled after the Tomb Guardians found in King Tut's tomb. They stand 6 3/4 inches tall. Item Number: PT-7742 | Approximate Size (Inches): 3.50 wide x 4.50 deep x 6.75 high | Approximate Shipping Weight: 2.00 lbs. This cold cast resin statue in black and gold s 8 1/2 inches .. This cold cast resin statue in black and gold s 8 inches high. .. This beautiful cold cast resin statue is a tiny 3 1/4 inches high with hand..